One of the regular readers of this blog sent me two photos of death records obtained from the Red Cross International Tracing Service at Arolsen, Germany. The records show that, as of 31.12.1983, there were only 373,468 known deaths in the main concentration camps during World War II. I was aware of these statistics, but I had never really looked closely at the numbers. The most surprising thing is that, by 1979, there had been only 6,507 death certificates issued for the deaths at Bergen-Belsen, and only 6,851 death certificates for Bergen-Belsen issued by 1983. Bergen-Belsen is a name that is known to every school child in America. Bergen-Belsen, the camp where Anne Frank died, has become a symbol of the Holocaust. In 1943, Bergen-Belsen was set up as a detention camp (Aufenthaltslager) for prisoners who held foreign passports and were thus eligible to be traded for German citizens being held in Allied internment camps. It was not until December 1944 that Bergen-Belsen became a concentration camp under the command of Josef Kramer, the former Commandant of the Auschwitz II camp, also known as Birkenau. Originally established as the prisoner of war camp Stalag XI-C, in 1943 it became a concentration camp on the orders of Heinrich Himmler, where Jewish hostages were held with the intention of exchanging them for German prisoners of war held overseas. Later still the name was applied to the displaced persons camp established nearby, but it is most commonly associated with the concentration camp it became as conditions deteriorated between 1943-1945. During this time an estimated 50,000 Russian prisoners of war and a further 50,000 inmates died there, up to 35,000 of them dying of typhus in the first few months of 1945. If 50,000 inmates died, why are there so few death certificates? Were the prisoners dying so fast in the typhus epidemic at Bergen-Belsen that there was no time to identify them? Were the SS men at the camp so sick themselves that they could not handle routine tasks? There were some privileged prisoners at Bergen-Belsen who were allowed to wear their own clothes; is that why so many bodies could not be identified? 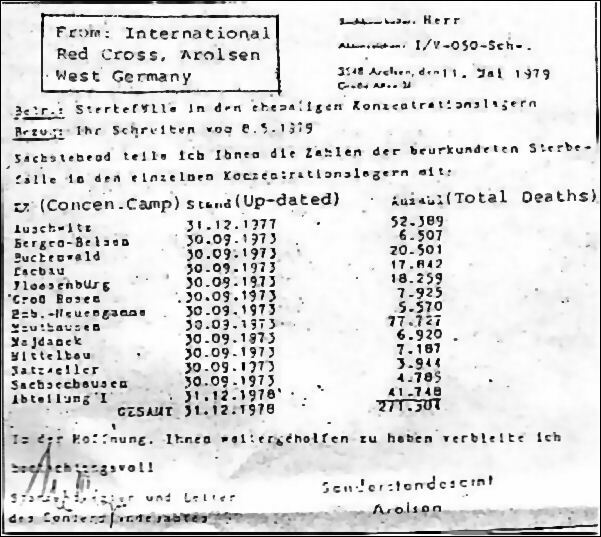 The death records at Arolsen are used by Holocaust deniers to prove that the official count of 6 million Jewish deaths and 5 million non-Jewish deaths is a gross exaggeration. The staff at Arolsen wants to make sure that the figures are not misinterpreted. 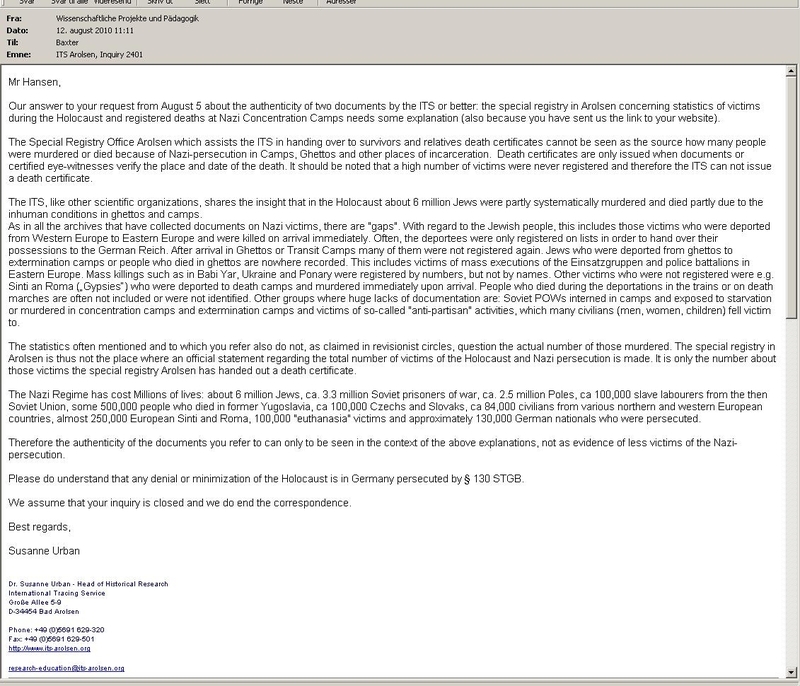 The photo below shows a letter which was sent to the person who made a request for the records. Note that the letter explains that this is not the number of deaths, but the number of DEATH CERTIFICATES. There were allegedly 13,000 deaths AFTER the camp was voluntarily turned over to the British on April 15, 1945; why didn’t the British take care of issuing death certificates for these 13,000 people? Could it be that the British claim of 50,000 deaths at Bergen-Belsen is an exaggeration? 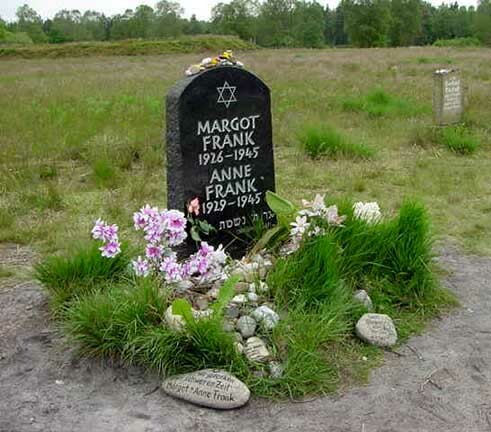 The photo above shows a fake grave for Anne Frank and her sister Margo; in the background, you can see one of the mass graves. No one knows which mass grave holds her remains. Anne and Margo were both assigned the date of March 31, 1945 for their date of death, but I’m not sure if a death certificate was issued for them. Unfortunately, no one took a picture that showed anywhere near 13,000 unburied bodies at Bergen-Belsen on April 15, 1945. The photo above shows only a few bodies. In the days just before the British arrived to take over, the German guards had ordered 2,000 healthy prisoners in the camp to drag the dead bodies to mass graves, using strips of leather or cloth tied to the ankles of the corpses. 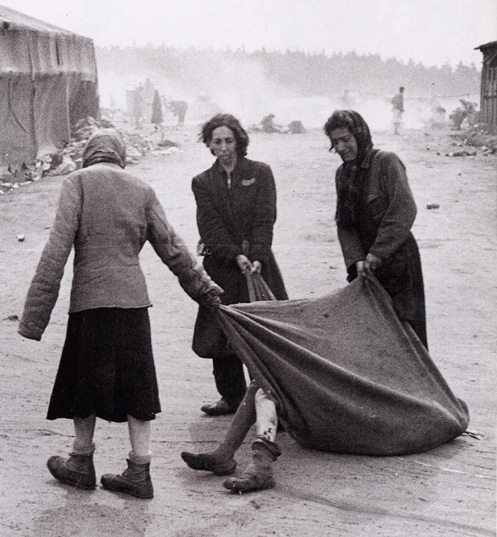 The photo above shows Bergen-Belsen prisoners dragging a body in a blanket; the Germans did not force anyone to handle diseased bodies with their bare hands. After the British took control, the German guards were forced to handle the diseased bodies without protective gloves, and 20 of the 80 guards became sick and died as a result. In the film that was shown in American theaters, the British narrator explained that this was done as punishment for the guards. The British soldiers would not touch the decomposing bodies; instead, they used bulldozers to shove the emaciated corpses into the mass graves. Many of the American viewers who saw the British film mistakenly thought that it was German soldiers who were driving the bulldozers. I can recall the horror when I watched this British film at the age of 12. I had to put my hand over my eyes; the next night, I went back to see the film again and didn’t cover my eyes. Leslie Hardman, a Jewish Chaplain with the British troops, wrote a book entitled “The Survivors – the story of the Belsen remnant” (Vallentine, Mitchell & Co. Ltd). He said that he was concerned after watching the bodies being shoved into the mass graves with a bulldozer. He asked the officer in charge if the dead could be treated with more dignity, but was told that the burial was urgent. The officer promised that he would call the Chaplain back to recite prayers when the grave was ready to be filled. 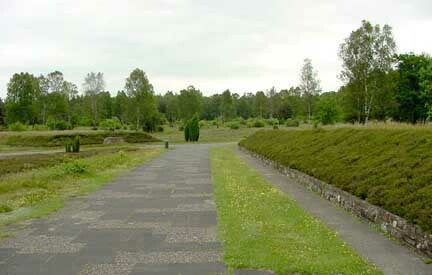 When I visited Bergen-Belsen several years ago, I didn’t count the number of mass graves. The photo above shows one of the graves which holds 2,500 bodies. Some of the mass graves have no stone that shows how many bodies are buried there. 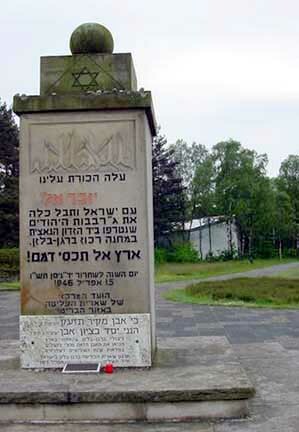 The photo above shows the Memorial stone at Bergen-Belsen for Chaim Herzog, president of Israel, who died April 17, 1997. 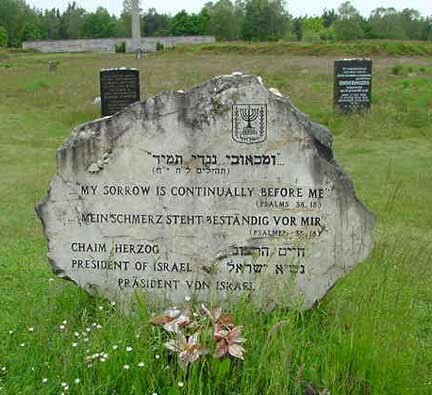 This is an honorary stone; Herzog is not buried at Bergen-Belsen. As a young intelligence officer from Palestine, serving in the British Army, Herzog was with the British troops that liberated Bergen-Belsen. His father was the Chief Rabbi of Ireland and later became the first Ashkenazi Rabbi of Israel. Herzog was present when Heinrich Himmler allegedly committed suicide after being captured by the British. Before surrendering Bergen-Belsen to the British on April 15, 1945, Heinrich Himmler had ordered about 7,000 people to be evacuated from the camp. The three train loads of prisoners, which left the camp between April 6 and April 11, were made up of prominent Dutch Jews, Hungarian Jews, Jewish prisoners from neutral countries and Jewish prisoners who held foreign passports. Himmler was hoping to use these prisoners to negotiate peace terms with the Allies. 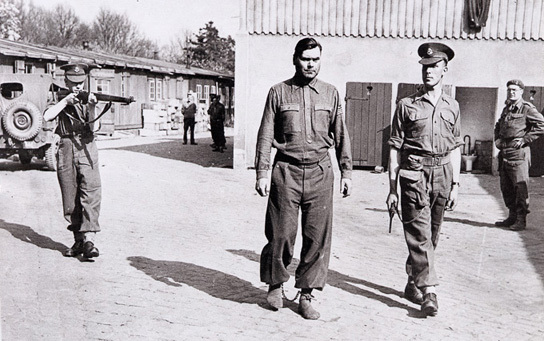 In preparation for surrendering the camp, two German officers had been sent to a British outpost to explain that there were 9,000 sick prisoners at Bergen-Belsen and that there was no water after the electric pump had been hit in an Allied bombing attack. The Germans proposed that the British Army should occupy the camp immediately to keep the epidemics in the camp from spreading to the troops on both sides. In return, the Germans offered to surrender the bridges over the river Aller. At first, the British rejected the German proposals, saying it was necessary that the British should occupy an area of ten kilometers around the camp in order to be sure of keeping their troops away from the epidemic, but eventually a compromise was reached and the British agreed. 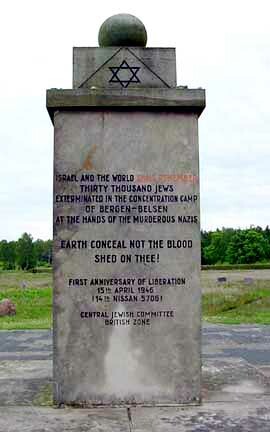 On April 15, 1945, Bergen-Belsen was surrendered to British Officer Derrick Sington, who wrote about it in a small book called “Belsen Uncovered” which was published by Duckworth, London in 1946. Of course, Himmler had not anticipated that the British would film the dead bodies in the camp and then show the film in movie theaters around the world without explaining that the prisoners had died of typhus. And he certainly didn’t expect that the staff members, who had voluntarily stayed behind in the camp, would be arrested, or that some of the Hungarian soldiers, who were assigned to help with the surrender of the camp, would be shot by the British. Commandant Josef Kramer stayed behind and met the British at the gate to offer his help. What a fool he was to trust the British! He was arrested and put into chains that very day. 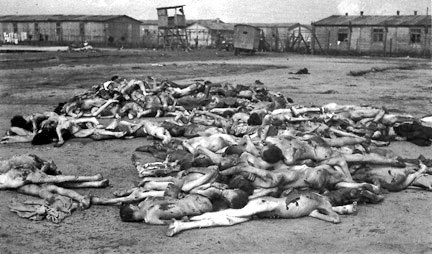 When the film of Bergen-Belsen was shown in American theaters, it was naturally assumed that the prisoners had been deliberately starved to death or killed in a gas chamber, since the film made no mention of the typhus epidemic in the camp. Nor was it mentioned that the water pump at Bergen-Belsen had been hit by Allied bombs and fresh water had to be brought in by trucks. When British soldiers were finally allowed, as agreed upon in the negotiations, to enter Bergen-Belsen on April 15, 1945, they at first saw nothing amiss, according to some of the liberators. Smiling, healthy prisoners came out to greet them and some of the 500 children in the camp cheered and waved to them. But as they advanced further into the camp, they were stunned by the sight of thousands of unburied naked bodies. The horror was beyond human imagination. The sickening stench of the rotting corpses was so great that British soldiers later claimed that they could smell the camp from a distance of 10 miles, although they had not smelled the bodies when they first entered, according to eye-witness reports. In the last months of the war, as the Russian army advanced westward, prisoners in the camps in Poland had been evacuated and ultimately 60,000 prisoners had been crowded into the Bergen-Belsen camp which did not have enough space for them. Some of those who were still alive at Bergen-Belsen were walking skeletons. There were a variety of diseases that were rampant in the camp. The Germans claimed that they had been unable to fix the broken water pump which had been destroyed by Allied bombs, and many inmates were dying of thirst, even though the camp was near a creek which the camp Commandant claimed was not fit for drinking. The camp used cisterns for its water supply, but the water could not be accessed without the electric pump that had been hit in a bombing raid. The nearby Army garrison had arranged for drinking water to be brought to the camp by truck, but it had not been nearly enough. The British promptly fixed the broken pump and provided water from the creek for the camp which had been without water for six days. Creek water? Is this why 13,000 prisoners allegedly died after the British took over? How many of the victims at Bergen-Belsen were Jewish? So if 30,000 Jews died at Bergen-Belsen, why are there only 6,851 death certificates? 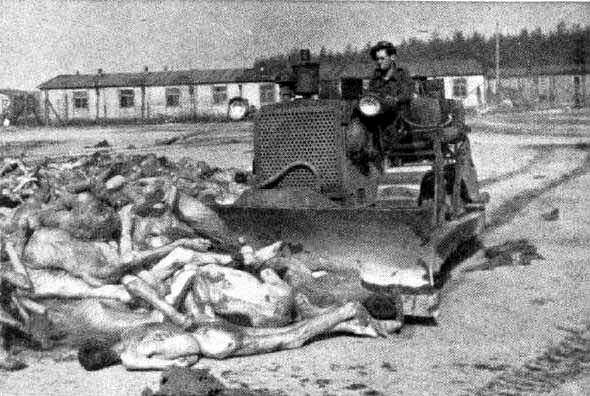 To stop the typhus epidemic, the British moved the prisoners to the SS garrison next door to the Bergen-Belsen camp and then burned down the whole camp. After the liberation of the camp, German civilians from the nearby towns of Bergen and Belsen were forced to remove the bodies of the prisoners who had died after the Brirtish took over, while the survivors of the camp stood by and jeered at them. 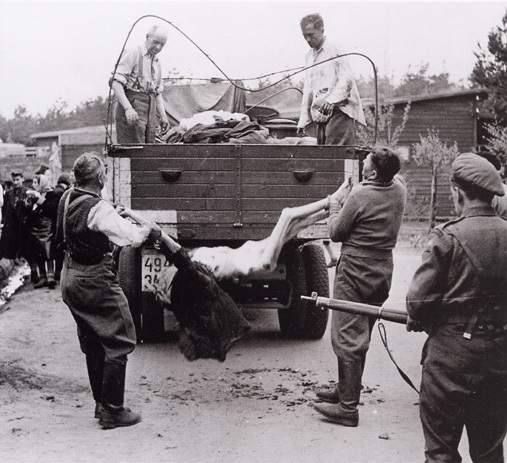 The photograph below shows a group of survivors in the background on the left, watching as German citizens are forced, at gunpoint, to handle the diseased bodies with their bare hands. 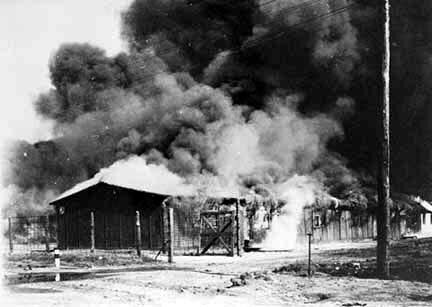 German homes in the nearby towns were taken by the British military and assigned to the surviving prisoners after the barracks in the camp were burned down. The photo above is a still photo from a film taken by the British. I saw this film when it was shown at the Memorial Site; the survivors in the background are screaming insults at the Germans. How was the typhus epidemic in the camp the fault of the German civilians in the nearby towns? 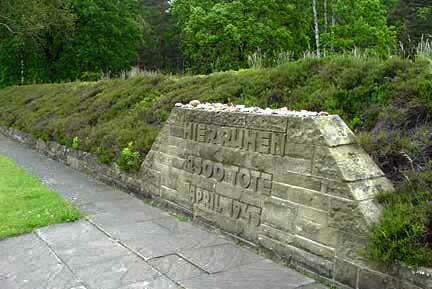 On May 4, 1945, part of the German Army surrendered to the British on the Lüneberg heath where the Bergen-Belsen camp is located. A few days later, on May 7th, the rest of the German Army surrendered to General Eisenhower. Eisenhower had been so sickened by the sight of 40 dead bodies on his personal visit to the Ohrdruf forced labor camp near his field headquarters at Gotha, that he stunned the Germans by refusing the traditional handshake after the signing of an unconditional surrender by the German Army on May 7, 1945. World War II in Europe officially ended the next day on May 8, 1945. Thanks to the foresight of Eisenhower, who ordered that every American soldier stationed in Germany should visit one of the liberated concentration camps, today there is scarcely a person in America who has not heard the stories of the Nazi atrocities first-hand from a relative or an acquaintance. However, it was the British who, by bringing their soldiers to Bergen-Belsen to see the ultimate horror so that they could pass their eye-witness information on to future generations, insured that the world now knows the “true story” of Bergen-Belsen. The film made by the British at Bergen-Belsen has been shown to students in America for over 60 years, so that the nightmare lives on. Bergen-Belsen is a name that has become synonymous with “man’s inhumanity to man.” So why should we worry about a small detail, like the number of death certificates? I don’t know about you, dear reader, but the Red Cross ITS records at Arolsen look suspicious to me. Especially, the records from Bergen-Belsen. I am doing a report on the holocaust and i am using this cite for my citations and i was wondering who the publisher is and what the authors actual name is if someone could please tell me it would really help me out thanks. Great article by the way. I don’t use my actual name on my blog because what I write is against the law in 19 countries, soon to be 20 countries when America passes a law against Holocaust denial. I could also be renditioned to Germany for trial, so I don’t use my name here. An issue of Time magazine, circa 1939, that I have seen in person, documents that the Nazis turned over a member of the notorious Rothschild family who had been accused by the Germans of decimating the economies of Austria and their nation by manipulating currency and banks (sound familiar…?). Now I ask you, WHY would Hitler —- who also is well-known to have stated that he planned to send the Jews anywhere out of Germany even to Madagascar, as long as they left Northern Europe —- turn over the biggest culprit in attacking the very life-blood of Germany, and yet want to waste years and troops needed on the Eastern Front to kill common Jews in camps…???!!! 1. The Germans had quite a bit of advance warning that the British were on their way to Belsen and successfully destroyed most of the records which – when recovered elsewhere – made it possible to compile lists of inmates. Although they could count the number of dead around them, they could not give the dead names, which made issuing death certificates impossible. 2. As part of their preparations for leaving the camp, the Germans destroyed the water pump. It was not damaged by Allied bombing. The Germans wanted were hoping that, without water, more inmates would die. 3. Was it appropriate for the British to force the German soldiers and local townspeople to handle corpses of typhus victims with their bare hands? Of course not. Was it appropriate for the British to shoot German soldiers on sight? Of course not. They were angry, and they did some stupid, vengeful things. 4. It wasn’t entirely appropriate for them to show footage of corpses without explaining that those people had died of illness and not of direct murder, either; however, one could argue quite successfully that the Germans murdered those people as surely as they murdered anyone they gassed. The illnesses that ran rampant within the camps did so because of wildly inadequet sanitation facilities, massive over-crowding, a complete lack of medical care, over-work, and starvation. Many of those prisoners had been forced to march for hundreds of miles from other concentration camps to reach Belsen and arrived exhausted. The long and the short of it is that the inmates wouldn’t have died had the Germans not forced them into camps, and that puts the responsibility for their deaths firmly on the Nazis. 5. In response to: “The British promptly fixed the broken pump and provided water from the creek for the camp which had been without water for six days. Creek water? Is this why 13,000 prisoners allegedly died after the British took over?” No, the creek water was not an issue. The issue was that by the time the prisoners arrived, many of the inmates were already too sick to be saved, and the British didn’t have enough medical equipment or trained personnel to treat them all. You can’t give a starving person a big steak dinner. Once a body has gone without food or with minimal food for a long time, digesting food becomes difficult for them. What they eat must be very easy to digest (think the BRAT diet) and given in very small quantities, the amounts increased slowly. Essentially, the British had to continue to feed them a starvation diet because their bodies couldn’t accept more for several weeks. Also, consider that typhus patients can be will for weeks, sometimes months, and that typhus is spread by body lice, which are not easy to get rid of in severely unsanitary conditions. The people who died after the British liberated the camp were sick before liberation, got sicker, and died; got sick for the first time, and died; or starved to death. As for why the British didn’t issue death certificates for them: I suspect they simply didn’t have the manpower to keep up with the number of people dying. There were 60,000 people in the camp when the British arrived, approximately 13,000 corpses that needed to be buried, and less than 15,000 British soldiers in the 11th Armoured Division. The vast majority of the inmates were ill, but even if you only estimate that 75% of the inmates were critically ill and that the entire division was available to tend to Bergen-Beslen, that still means that each soldier was trying to care for three sick people, bury a dead person, secure the camp, fix the water pump, and somehow rid a huge area of lice. Plus they had the town to secure and whatever the service needed them to do outside of the camp. Not to mention that most of these soldiers knew nothing more about medicine than first aid. 9000 more people died in the first two weeks after liberation. That’s a lot of people to try to document, particularly when those people have typhus, which can cause delirium, or starvation, which can cause severe confusion. 6. In response to a couple of comments: It’s hard to deny that the Allies perpetrated atrocities during WWII (and during conflicts since). One cannot help but think of the bombings of Dresden and Hiroshima. Neither was necessary, and it’s entirely possible that, had the French and English honored their committments to support Poland when Germany invaded, the entire war could have been avoided. However, I think that part of what bothers peopple (certainly part of what bothers me) is that, while America acted out of anger and a desire for vengence, lashing out like an angry child with frighteningly powerful toys, Germany acted with a cold, clear mind. The systematic, orderly way that Germany decided to categorize other people as “sub-human” suggests that the leaders of the Nazi party had lost a deep part of their own humanity, and that’s very frightening. The Allies, on several occassions, did kill people indiscriminately and without reasonable provocation. However, we never implemented a step-by-step plan to kill all of the mentally ill people in Poland, which the Nazis did (resulting in thousands of casualties). We never kidnapped children from Germany and, if their eyes were too far apart or two close together, used large needles to inject their hearts with chemicals that would take several minutes to kill them. There is simply no comparable action that any other country took. Even Germany’s allies did not commit such atrocities. No one in Romania performed medical experiments on twins that amounted to nothing more than torture. No one in Italy rounded up troops of boy scouts and executed them in the streets. Churchill did not tell his country that he had invaded another country merely to protect ethnic Englishmen while secretly telling his generals that “this must be a war of annihilation.” Moreover, having won the war, none of the Allies chose to exterminate the Jews, gypsies, homosexuals, disabled people, Poles, Slavs, and then the rest of the world, which is precisely what the Nazis planned to do (in that order), a plan they began to impliment the moment they crossed onto Polish soil. So I think it’s unreasonable to say that the Allies are equally responsible for the horrors of WWII. However, both sides bear some responsibility for war, and will continue to until we as a global community realize how nonsensical it is to try to create peace by deliberately creating the exact opposite: war. Just some thoughts. Hope you found them helpful! You forgot to explain away the fact that the Bergen-Belsen camp was initially set up as an EXCHANGE camp. Hitler was hoping to exchange prominent Jews for the German citizens being held in ordinary prisons in England and for the German citizens being held in internment camps in the United States. Hitler expected to exchange 30,000 prisoners but only a few thousand were exchanged by the British and the U.S.
Himmler arranged to voluntarily turn the Belsen camp over to the British, so of course the Germans knew that the British were on their way. You didn’t explain why the Germans destroyed the records, but left SS men and women behind to help the British take over the camp. It seems strange that the Germans would voluntarily turn the camp over to the British, but destroy the water pump before they left. The Germans had plenty of time to kill all the inmates before they left so why leave behind a destroyed water pump to kill the prisoners with dirty water after they were gone. You wrote: “The systematic, orderly way that Germany decided to categorize other people as “sub-human” suggests that the leaders of the Nazi party had lost a deep part of their own humanity, and that’s very frightening.” The people that Germany categorized as “sub-human” were the people who categorized every person on earth as non-human except for themselves. At least the Germans didn’t categorize themselves as “the Chosen” and all others as non-human animals. As Jews constitute a nation, which declared war on Germany in 1933 by the way, they were arrested as enemy nationals during wartime beginning in 1941, two years after Great Britain started to deport every German on their soil into concentration camps. Besides, all those whining about the poor jews seem to overlook that the Democrats and Communists chased away over 14 millions Germans from east Germany AFTER the war. East Germany is still occupied by Poland and Russia by the way. So why don’t you go and tell your sob stories about the poor jews to the Palestines? They might be interested, I am not. But the Allies are the ones to blame, and they are the ones that were “passing the buck” and deflecting the blame on Germany, which they utterly destroyed in addition. And why exactly was “the whole system” evil? Was the “whole system” of the Democrats, who deported millions of Japanese, Italians and Germans to concentration camps evil as well? Holocaust deniers seem to overlook the basic fact that Jews and political prisoners were robbed of their homes and belongings, their families were broken up and were deprived of most basic human rights. Trying to blame the Americans and English for prisoner deaths is called “passing the buck” or deflecting the blame to someone else. No matter how many died in concentration camps, the whole system was evil and minimizing the casualties does not detract from that basic fact. If by “Holocaust Deniers” you mean Holocaust Revisionists, No they don’t overlook that. It’s mentioned in almost all Revisionist works I know. They do however put that into context, which is what Holocaustians rarely do. The first document from Arolsen appears to be a report made per someone’s request. The name of the receiver is carefully erased. The last phrase: “In der Hoffnung Ihnen weitergeholfen zu haben, verbleibte Ich hochachtungsvoll”. The style of this phrase, which is beyond simple courtesy, demonstrates that the addressee was someone extremely important. The report was requested by someone outside of ICRC line of command. Since Arolsen office does not open it’s archives to general public, my question is how important was that person? That German phrase makes me to think that the person, who requested this almost “top-secret” information was at least a president of a country or holding similar position. Who would it be in 1979? The leaders of USSR won’t make such request; they could get the information in KGB archives. PM of Britain Margaret Thatcher? I doubt it, since she was just appointed on 05/04/79 and the date of request was 05/08/79. Presidents of France or other non-German speaking countries would not be interested in obtaining such information. Arolsen office, most definitely, would refuse to provide such information to the leaders of Eastern block countries and they would not even dare to ask. By the method of exclusion; I came up with only four possible names: President Jimmy Carter of USA, Chancellor Helmut Schmidt of West Germany, UN Secretary-General Kurt Waldheim, who was an Austrian, and Prime Minister of Austria Bruno Kreisky, who was Jewish. Helmut Schmidt was quater-Jewish which did not affect his career as a Wehrmacht officer,last rank: first-lieutenant. In 1994, former Mossad officer Victor Ostrovsky claimed in his book The Other Side of Deception that Mossad doctored the file of the then UN Secretary General to implicate him in Nazi crimes. These allegedly false documents were subsequently “discovered” by Benjamin Netanyahu in the UN file, and triggered the “Waldheim Affair”. Ostrovsky says it was motivated by Waldheim’s criticism of Israeli action in Lebanon. Kreisky was notable for his apologetic approach to former Nazi party members and contemporary far-right Austrian politicians. For example, Kreisky praised a far-right populist Jörg Haider calling him “a political talent worth watching”. When Simon Wiesenthal reported that four members of Kreisky’s 1970 cabinet had Nazi backgrounds, Kreisky didn’t remove them from the government, and responded to Wiesenthal. This incident marked the beginning of a bitter conflict, which hadn’t ended until Kreisky died in 1990. In 1986, Wiesenthal sued Kreisky for libel. Three years later the court found Kreisky guilty of defamation and forced him to pay a substantial fine. I wish, someday, we would be able to find out who exactly requested the information from Arolsen office.But my best guess would be one of those four persons. Anyone has some suggestions or ideas? I would really appreciate sharing them with me. The truth about the “holocaust” is far more than Americans can bear. Those horrible photographs of Belsen and Dachau and other German concentration camps in the last two months of the war are enormously important. They are the real basis, the “undeniable evidence” for the “holocaust” as far as nearly everyone is concerned. By contrast, the “evidence” from war crimes trials and the arguments of scholars, even revisionists, are largely unknown and even incomprehensible to nearly everyone. The photos do indeed portray a kind of holocaust. But, instead of showing how horrible war truly is in general, the images are grossly misused to condemn the very people—the Germans in general, and the SS and Nazis in particular—who had gone to enormous lengths to keep the victims alive and prevent such horrors! When historians and journalists insist that the scenes from Belsen and Dachau are aberrations from a more acceptable kind of the warfare, they are the greatest liars. They are simply massaging the egos of their depraved patrons, the victors of World War 2 and the masses behind them. Those misused scenes represent essentially the same horrors of nearly every war going back to the most preimitive siege warfare from our earliest history. For the German concentration camps, there are absolutely no photos of corpses from poison gas, anywhere. For WW2 at war’s end, the horrible scenes in Belsen and Dachau were the direct result of the cowardly blockade beginning the moment Britain began its war against Germany and the bombing (begun by the British on May 11, 1940) and strafing of civilian targets throughout most of the war. Even Germany’s water supply had been proudly bombed by the British in 1943 with obvious consequences. Eventually, with America’s involvement and overwhelming air power, such cowardly strategies achieved the shocking results that one could see throughout Germany. The immediate cause of death for the vast majority of genuine victims in German concentration camps was disease —and the Anglo-Americans knew it since they had sought just such results countless times in the past, even for the period after the 1918 Armistice to force Germany to sign the Versailles Treaty six months later, against its will, after 500,000 German civilians had died from disease and starvation caused by the blockade. But, rather than admit that it was they who had inadvertently also killed thousands of Jews in the process in WW2, the embarrassed Americans and Brits blamed the Germans instead. They had, after all, won the war and could get away with anything. The crimes against civilians by the US and Britain would have been bad enough if WW2 had been the end–but such horrors have continued with nearly all of the Anglo-American wars since then and there is no end in sight. If Americans or Britains want to hunt down and punish real perpetrators, real “killers,” real mass murderers—they need only look at themselves in the mirror and hang themselves from the nearest tree. A small correction. The first document is dated 1979 not 1973. Anti-revs sometimes pretend to dispute the authenticity or at least question it – as its not entirely clear how it emerged. But the ICRC had opportunities to denounce it as a forgery (at the Zundel trial amongst others) and did not do so. So I am pretty sure its genuine. I have never considered the Belsen angle. You will also notice a very high number for Mauthausen. I believe this might be due to automatically issuing a certificate for everyone on the deathbooks there. Thanks for the correction. I have changed the date to 1979. I did notice the high number for Mauthausen. The only explanation is that this must be the total for the main camp and all the sub-camps. At the Nuremberg IMT, a set of seven death books with the title “Totenbuch – Mauthausen” on the cover of each one, was introduced by an American prosecutor as Document Number 493-PS, Exhibit Number USA-251. These death books had been confiscated from the Mauthausen main camp by the American liberators. The death books covered the period from January of 1939 to April of 1945, according to the American prosecutor who said, “They give the name, the place of birth, the assigned cause of death, and time of death of each individual recorded. In addition each corpse is assigned a serial number, and adding up the total serial numbers for the 5-year period (sic) one arrives at the figure of 35,318.” The death books did not include the deaths in the sub-camps. 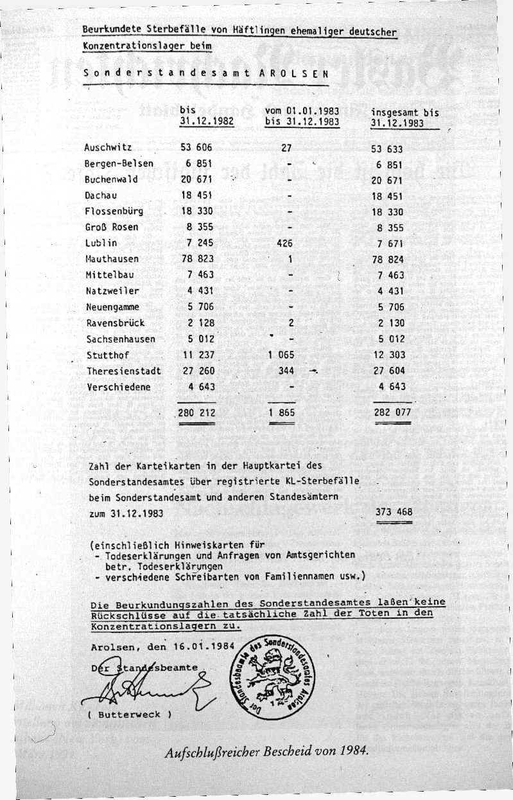 The figure of 35,318 is consistent with the death figures for Dachau, Buchenwald and Sachsenhausen. 70,000 would not be consistent with the other camps in the Greater German Reich, so it must include deaths in the sub-camps.